Home Blog What Do You Do When There’s Nowhere Else to Turn? Jesus really had nowhere else to turn. He was left to bear his torment alone, struggling to make the arduous way up Calvary. Who was there to reach out to him? The guards? Not a chance. Their objective was to make our Lord’s suffering worse in every possible. way. Would the onlookers offer him comfort? Perhaps some were sympathetic, but most were as hostile as Pilate’s soldiers. Even if any of them had wanted to, they were too afraid to openly demonstrate their concern for Jesus. But there was one person who cared more than anyone else. One person who was allowed to approach. 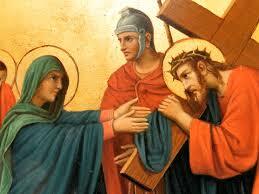 She went to Jesus, offered what comfort and encouragement she could, and let him know that she shared his agony. In your own suffering, it might seem as though there is no one who can break through the barriers and offer you comfort and encouragement. She not only can, but she will. You need only stop briefly on the way up Calvary to allow her to approach. Let your eyes meet, let her speak to you, and let her intercede for you before her Son. Whose Simon of Cyrene are You?